Unravel makes data work – providing full-stack visibility and AI-powered guidance to help you understand and optimize the performance of your data-driven applications. Gartner named Unravel a Cool Vendor for our innovations in performance analysis for analytics and containers. WHAT CAN UNRAVEL DO FOR YOU? Deliver on the promise of data. Unravel helps you monitor, manage, and improve your data pipelines – to drive more reliable performance in the applications that power your business. Full-stack observability and AI-powered recommendations for every big data ecosystem — Cloudera, Hortonworks, MapR, Microsoft Azure, Amazon AWS, Databricks, and beyond. Get a unified view of your entire stack. Unravel collects performance data from every platform, system, and application, then uses agentless technologies and machine learning to model your data pipelines from end to end. Explore, correlate, and analyze everything in your big data environment. Unravel’s data model reveals dependencies, issues, and opportunities, how data and resources are being used, what’s working and what’s not. 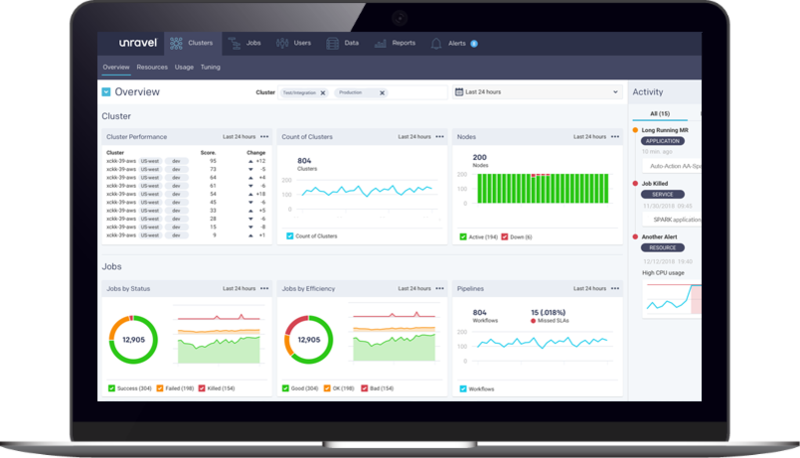 Don’t just monitor performance – quickly troubleshoot and rapidly remediate issues. Leverage AI-powered recommendations to automate performance improvements, lower costs, and prepare for what’s next. See, improve, and plan performance across your data pipelines and modern data applications. More than just insights – get actionable recommendations and automation. The average big data stack is made up of so many tools, technologies, and services that it’s hard to see how everything works together – where the problems are, what you should focus on, what you could do better. Unravel provides a unified, end-to-end view of everything going on in your environment, so you can understand and optimize performance across every application and business unit – in the cloud and on-premises. Don’t settle for solutions that only monitor performance – providing charts and dashboards but leaving it up to you to figure out next steps. Only Unravel goes beyond raw visibility to provide concrete, AI-driven advice: Code you can use. Specific settings you can tweak. Recommendations you can immediately implement or automate to fix issues and optimize performance. What are customers saying about Unravel? Don’t just monitor performance – optimize it.